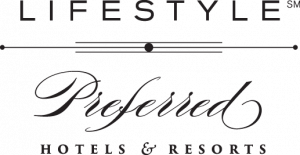 Relax in elegant rooms and suites featuring luxurious furnishings, thoughtful service and the latest technology. Lancaster Bangkok offers a number of lavishly appointed rooms and suites featuring luxury furnishings and the latest technology. Rooms begin with a generous 40sqm of floor space, and each room features a king or twin-sized beds and luxury bathroom featuring a free-standing bath and separate rainforest shower. Our 40sqm deluxe rooms are designed with both business and leisure in mind. 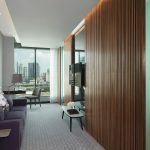 They feature floor-to-ceiling views of the sparkling Bangkok cityscape and all the amenities you need to ensure a comfortable, private and relaxing stay. Perfect for families, these spacious rooms offer with 56 sqm of floor space. Our modern amenities and contemporary furnishings create a relaxing environment for both adults and children. Designed to accommodate up to four people, our family rooms offer two bedrooms, with a king-sized bed in one room and twin beds in the other, as well as a mini lounge to relax in. Check in to one of our spacious suites at Lancaster Bangkok, which feature luxurious and comfortable modern furnishings as well as a city view. Each suite also features an oversized bathroom where you can enjoy a luxurious Jacuzzi bath with marble accents, a separate glass shower, dual vanities and a spacious walk-in closet. Our suites, in size from 72 sqm, offer a separate plush living space to relax or entertain in, a private bedroom with a king-sized bed, state of the art technology, and a full kitchen with upscale appliances and accessories, including a coffee machine and game console. Our apartments are designed with extended stays in mind, so that you can enjoy a home away from home. These spacious, ultra-modern apartments with 70sqm and offer a stylish in-suite, fully-equipped kitchen, high ceilings, a spacious walk-in closet, a dining area and an entertainment centre with a DVD player. Stay a week, a month or even a year. Experience Bangkok in comfort from one of our spacious apartments. 5 star hotel with authentic Thai hospitality near to Sukhumvit road Bangkok. The new 5-star hotel Lancaster Bangkok offers the truly authentic Thai experience with impeccable hospitality. 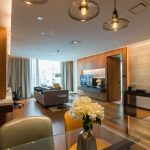 Relax in one of the stylish and contemporary luxury rooms or stretch out to one of the larger apartments or suites where you can enjoy breathtaking Bangkok city views. The Lancaster Bangkok hotel is conveniently located close to the cosmopolitan shopping malls and high-energy nightlife of Sukhumvit Road, in the heart of the Makkasan district. The hotel is family owned, and no detail is spared in order to make guests feel welcomed and comfortable during their stay. For guests visiting the city as part of a sight-seeing holiday the hotel’s location on the Phetchaburi road places the Platinum Fashion Mall, MBK and Terminal 21 at our guests fingertips, while the many historic monuments can be easily reached using the Khlong Saen Saep boat service that departs close by. The MRT Phetchaburi train station is just 350m away and Asok BTS station is less than 2km and easily accessed via the connecting MRT. The Lancaster Bangkok is an ideal place from which our leisure guests can explore the whole city. 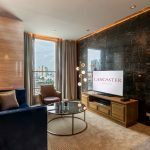 Lancaster Bangkok offers a number of lavishly appointed rooms and suites featuring luxury furnishings and the latest technology. Rooms begin with a generous 40sqm of floor space, and each room features a king or twin-sized beds and deluxe bathroom, with a free-standing bath and separate rain-forest shower. Guests may also enjoy authentic Asian and exquisite international cuisine at our in-house restaurant, Siam Brasserie; sample delicious cocktails and Thai tapas in the Lancaster Bar; or enjoy smoothies at the rooftop pool High Bar. Meanwhile, the exciting bars, restaurants and nightclubs of Sukhumvit are close by. The city’s sacred Buddhist temples, the world-famous Grand Palace – undoubtedly the city’s most famous landmark – and the Chao Phraya river are easily accessed by public transport or the hotel can easily arrange a taxi or tuk-tuk. We look forward to welcoming you at Lancaster Bangkok – a new beacon of Thai hospitality in the city.